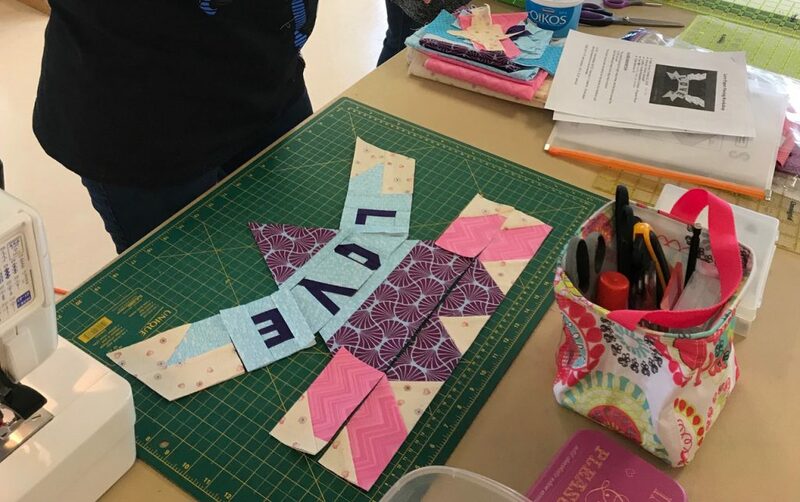 Have you always wanted to learn how to do foundation paper-piecing but been too afraid to try? Or tried, hit the wall and never tried again? Or maybe it’s just been a while and you’re feeling rusty. Well then this is the workshop for you! It’s a very clever technique that opens up a whole new world of patterns to make. Let’s piece some LOVE and learn to LOVE to paper-piece. Berene Campbell is a pattern designer that specializes in foundation paper-piecing patterns over at www.happysewlucky.com. 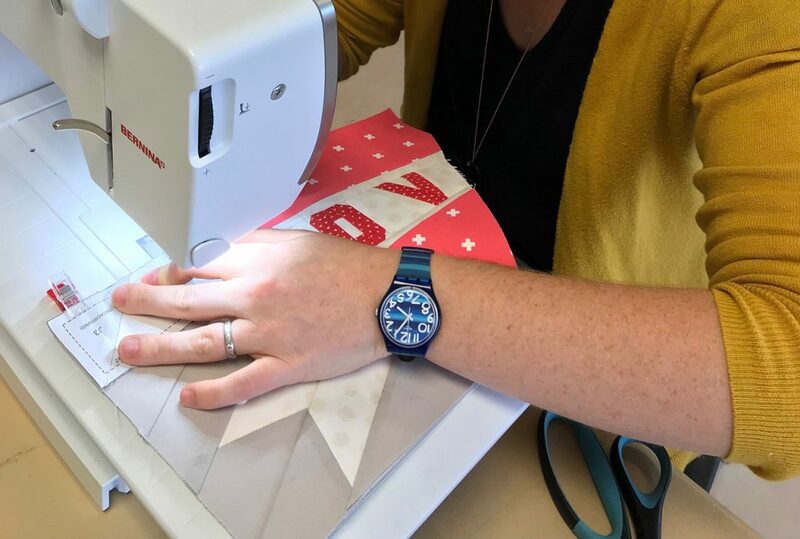 She uses paper-piecing as a way to destress. (Crazy but true!) Although many people are scared of trying it, she believes that once you nail the technique, it is amazingly calming. 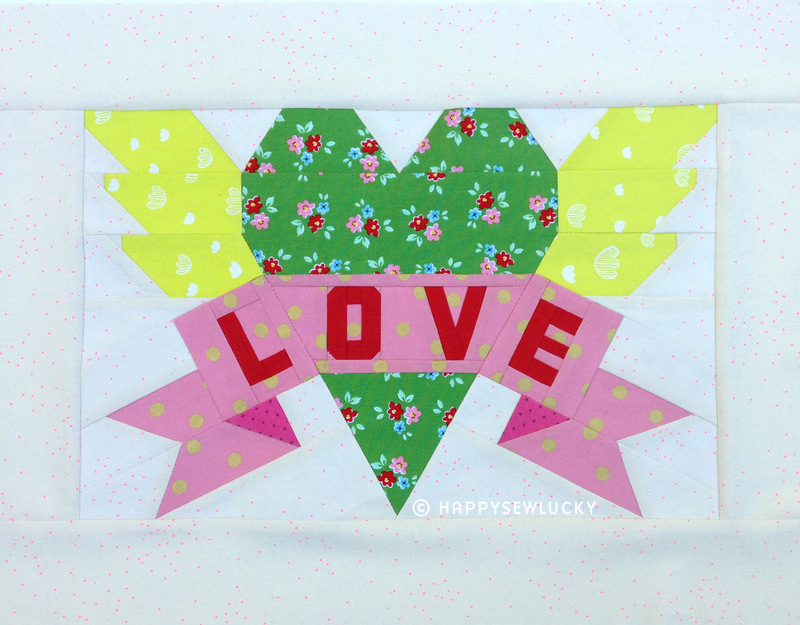 In this workshop you will be working on Berene’s “Love Heart Tattoo” block. • How to stitch sections with Y-seams like a boss! The finished size without borders is 16” wide x 10” high. It can be used for a mini quilt, as a centre block for a medallion, makes a great pillow, or if you really do fall in love with paper-piecing it could be your start of the whole tattoo quilt pattern. Cost:$65 for members. Additional cost of purchasing the Love Heart Tattoo Pattern through Berene’s website. Workshop fees are non-refundable. Non-members can email workshops@vancouvermodernquiltguild.ca to be placed on the waiting list. Cost will be $80. Ryan’s Case for Smiles is a worldwide not for profit that is dedicated to helping kids feel better to heal better through donations of comforting, handmade pillowcases. Cindy Kerr created the organization after her son Ryan was diagnosed with Osteosarcoma at the age of twelve. Cindy was a quilter and wanted to brighten up her son’s room while he was in the hospital so she started sewing him bright, cheerful pillowcases. As most of us sewists know you can never ever make one of anything cute and fun so Cindy started making pillowcases for all the kids who were on the oncology unit along with Ryan. She saw what a huge impact these pillowcases had on kids and decided to see if she could help kids at other hospitals too. Eleven years later Ryan’s Case for Smiles has delivered over 1.7 million pillowcases worldwide. We donate more than 200,000 pillowcases yearly to children at over 360 hospitals, Ronald McDonald Houses, camps and Hospices. Our chapter in British Columbia was started 8 years ago while I was juggling life with a houseful of busy little boys and looking for a way to help out other kids. I found out about Ryan’s Case for Smiles on an online sewing forum and had emailed the charity looking for the contact of a local coordinator I could drop off pillowcases with. I heard back from Cindy and found out there were no coordinators in Western Canada. My plan of donating a dozen pillowcases quickly turned into jumping in as a coordinator and informing my Mom we were starting a chapter in British Columbia. Our chapter now donates over 1,000 pillowcases a year to BC Children’s Hospital, Ronald McDonald House, Abbotsford Hospital and Camp Goodtimes. We are always needing help to keep up our donation numbers. The best way to help is by sewing up a pillowcase. If you have a bit of spare time one day you can get a few pillowcases done in under an hour. If you have any sewing friends and are up for organizing a sewing day you can get a big stack of pillowcases done in just a few hours. If you are a teenager who is looking to fill volunteer or community hours, sewing pillowcases is a great way to get those hours. I frequently sew with elementary school classes as well and the kids always do an amazing job and are so excited to find a way to help kids just like them. They’re also a fantastic project for Guiding and Scouting groups to earn their service badges. If you don’t have the time to sew we can always put fabric donations to good use. As a bonus when you clear off some room on your shelves by donating fabric to us you have an excuse to go buy more fabric! We ask that pillowcases only be made of cotton wovens or flannel. Pretty much any print or solid fabric is great. The places we donate to ask for no religious themes and nothing with skulls. We donate a huge amount of Christmas/winter and Halloween pillowcases every year so holiday themed pillowcases or fabric are always needed. Other donations that are helpful are colour catchers, rotary blades, thread and large (26.8cm x 27.3cm) size Ziploc plastic bags. Monetary donations are also welcomed as it costs about $11.00 to make each pillowcase. If you don’t have a favorite pillowcase pattern already here are a few great tutorials you can check out. You don’t have to specifically use any of these. They just give you a good idea of size and different ways they can be made. If you already have a pillowcase pattern you love to use or if you find a tutorial online that works better for you go with it! The pillowcases just need to fit over a standard size pillow. You do not have to pre wash your fabrics. Each pillowcase gives a child something soft to snuggle while reminding them of the comforts of home. They help brighten up hospital rooms, spread some much needed cheer and help kids feel more at ease while undergoing treatments and surgeries. I have received stories of pillowcases having to be overnighted to the hospital after being left at home because a little one refused to go into treatment without it under their head, parents having to drive hours and hours home to retrieve a misplaced pillowcase, threadbare pillowcases that have literally been loved to pieces and pillowcases that have been a huge source of comfort for hundreds and hundreds of hard days and nights for some amazingly strong kids. One yard of fabric, 15 minutes of your time and a bit of love can make an incredible difference to people who need a little extra love during some tough days and nights. More info can be found at caseforsmiles.org. If you need any extra help or have any questions you can email Kelsey at ryanscaseforsmilesbc@hotmail.com. 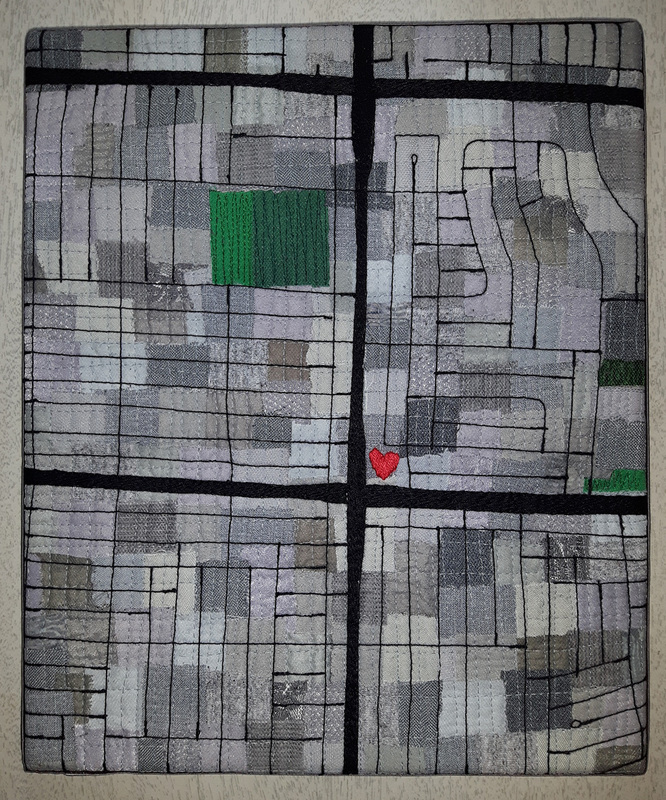 If you are part of the Vancouver Modern Quilt Guild and have any pillowcases made up you can bring them to any meeting and hand them off to Kelsey (me!). If I’m not at a meeting you can give pillowcases to Arita or Michelle B, they will collect them. Our own Krista Hennebury is back to teach her Level Two Tote. Note the workshop will be held at the Danish Luthern Church in Burnaby. Looking for a sturdy, functional tote for yourself or perhaps a fabulous Christmas gift for friends? 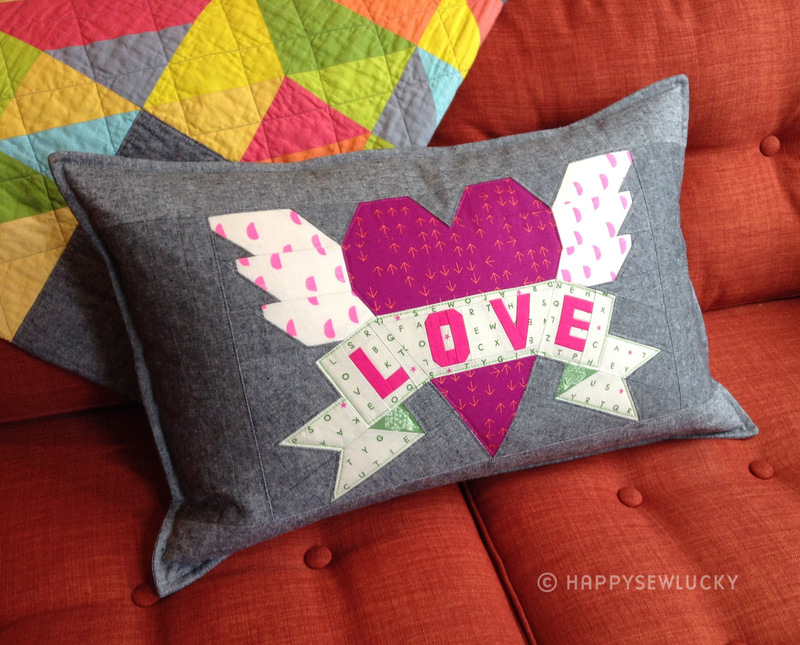 Show off your favourite special fabrics in this project. With just a wee bit of pre-class cutting, you’ll leave the workshop with a completed bag! No special tools required; I will bring everything you need to punch your leather straps and install the rivets. UPCYCLE OPTION: have you got an old leather or suede skirt or jacket? The bottom level fabric piece is 17”w x 16”h. If you can cut a piece this big, then you’re in business! Pattern & Notions Kit fee: $35/student. Kit includes leather handles in black or veg-tanned natural, matching leather rivet tabs, 8 rivets and coordinating metal zipper and magnetic closure in nickel or brass coloured metal. Extra hardware kits $25 ea. Sign up is available using PayPal Button below. Place: Danish Lutheran Church, 6010 Kincaid Street, Burnaby, B.C. Cost: $50 for members. In addition to the pattern or notion kit to be purchased from Krista. Non-members can email workshops@vancouvermodernquiltguild.ca to be placed on the waitlist. You will be advised after October 15th if space is available. Please join your quilting friends and our host, Susanne, at VMQG’s next Sew-in! Sign-up begins at September’s VMQG meeting. For this workshop, we’ll be taking the techniques used for the map above to create smaller personalized maps. 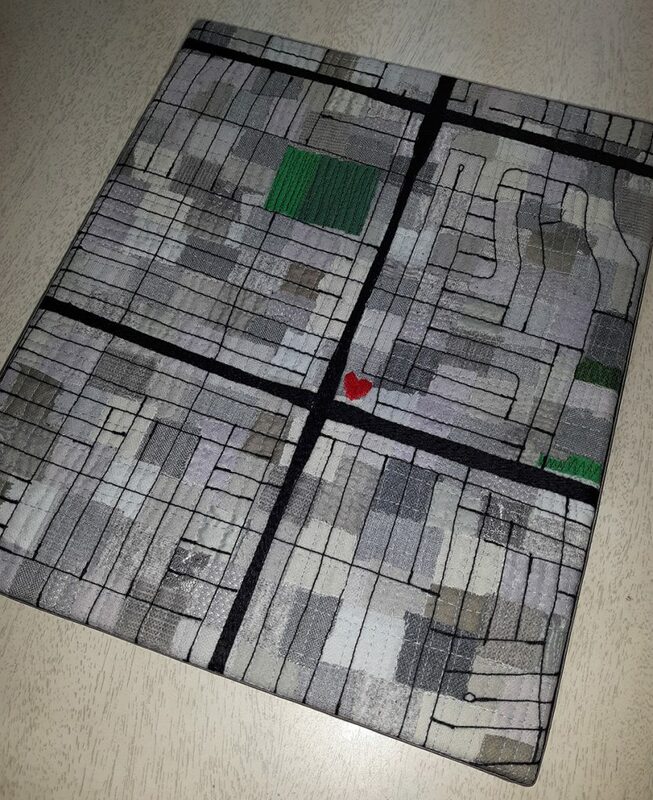 A combination of raw edge applique and confetti applique will be used to create a map that showcases a special location in your life. Home can literally be where the heart is! We’ll use free motion quilting and straight line quilting to construct a wall hanging, but you don’t need to be experienced at either technique. The supply fee includes the beginning of a personalized pattern using the address of your choice – you’ll finish creating the 10” x 12” pattern during the workshop. Whether or not you complete your quilt by the end of the day depends on how complex your pattern is, but most people should start on the last step. Participants will take their quilts home to rinse and wash before assembling the wall hanging. There will be discussion and demonstration towards the end of the workshop of ways to complete the quilt after washing, including how to mount the quilt on stretcher bars and finish the sides, if that is the technique you choose. This is a fun workshop. We’ll get sticky (sometimes very sticky!) and play with scraps of fabric, and quilt through lots of layers and sometimes stitches might skip. You won’t end up with an award worthy quilt with a gorgeous backside, and that’s okay because you’ll be learning a new technique and making a quilt that means something to you. The machine you bring to the workshop needs to be able to do straight walking foot quilting, free motion quilting and zigzag stitch. This workshop uses a variety of tools that are chemical based, most notably 505 adhesive and sharpie markers. Please be aware of this – it’s recommended that you wear a mask while using these tools, and if it is a rainy day, we will be using spray adhesive inside. If you are especially sensitive to 505 spray adhesive, this may not be the class for you. In addition to the workshop fee payable to VMQG, there is also a $20 per person supply fee payable to Amy directly. 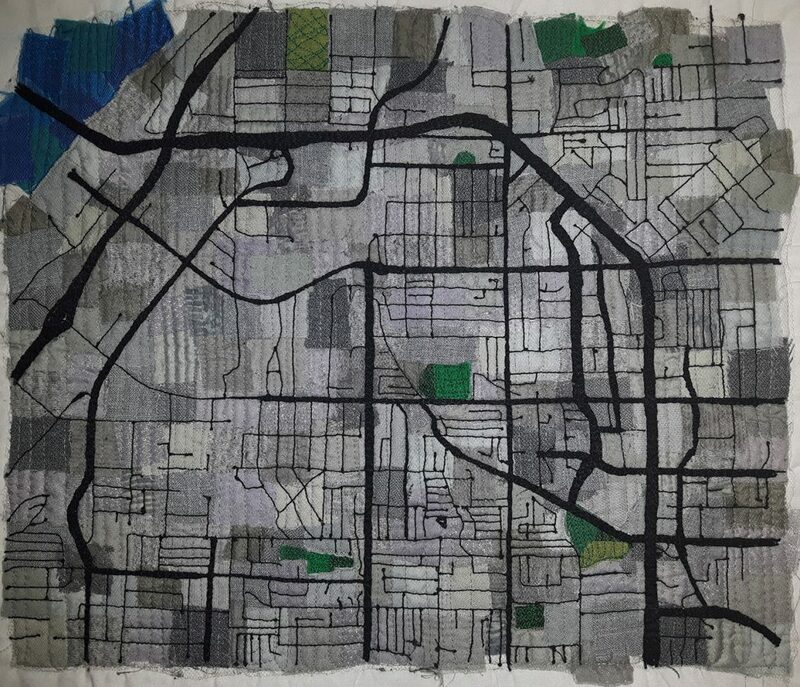 The $20 supply fee covers the map base fabric, tulle, wash-away stabilizer, 12 weight thread, yarn, a schmetz 110/18 denim needle, print outs for your individualized map pattern, and the grey, green and blue fabrics used for the maps. 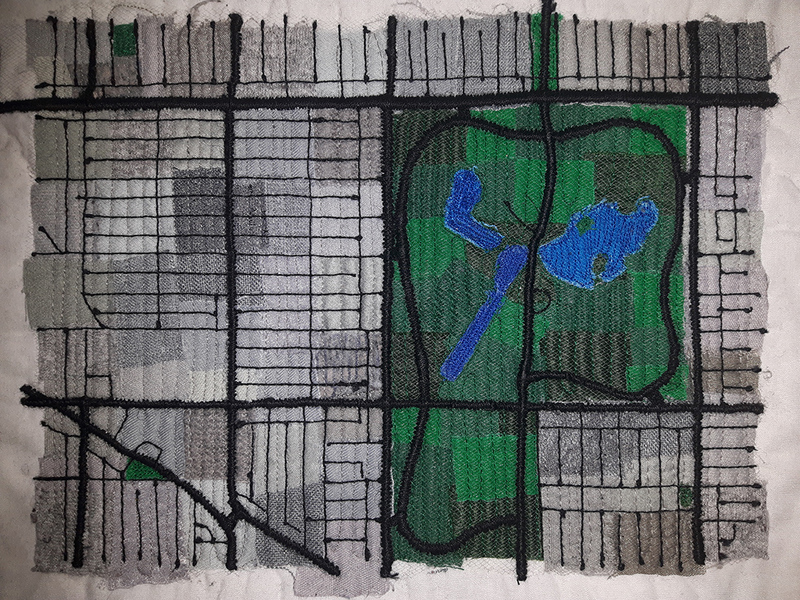 (If your map is not of an urban area, you will need to bring your own fabric.) A supply list will also be distributed, and you will need to bring the items on the list to supplement what is provided for you. Cost: $50 for members, $65 for non-members with an additional $20 supply fee paid to Amy directly. This is a reminder that our next meeting will be on Monday, September 17th, 2018! Our upcoming meeting will feature one of our members, Terry Aske who will be doing a trunk show of her work for us. She will also be teaching a sold-out workshop for us in September. The October retreat is full, however, we are taking names for the waiting list if you think you may want to attend but have not yet signed up. 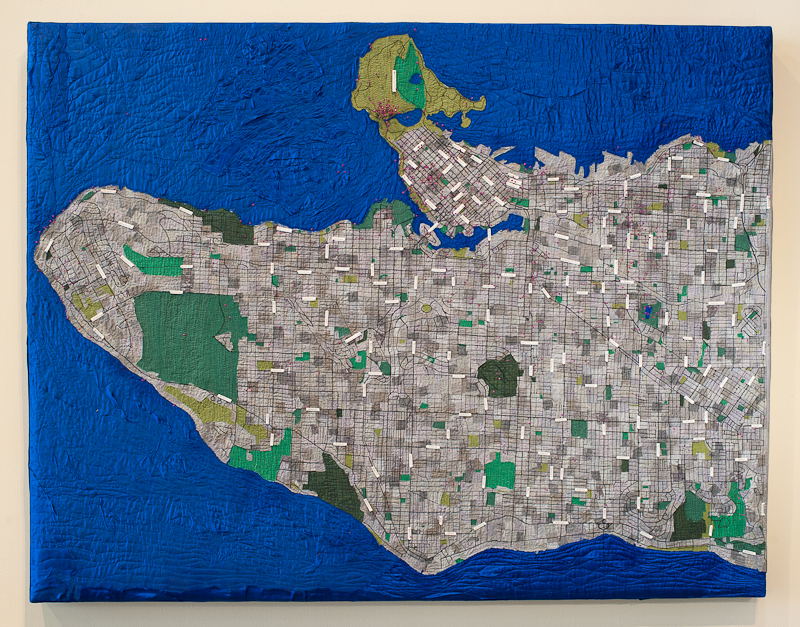 We hope you’ll join us in North Vancouver for our 2nd biennial Modern Quilt Showcase! We’re so excited to transform this amazing renovated shipbuilding warehouse into a spectacular modern quilt show. Saturday, August 25 from noon – 8 p.m.
Sunday, August 26 from 10 a.m. – 5 p.m. Accessibility: The level-entry site is accessible with new washroom facilities inside the Pipe Shop. We will have a complimentary wheelchair onsite for anyone requiring it’s use. For your most efficient driving or transit route, please enter 115 Victory Ship Way, North Vancouver into your favourite navigation software or app. The simplest way to visit our show is by public transit – the Pipe Shop is a half block east of Lonsdale Quay Seabus and transit bus terminal. Driving? There is free weekend parking available in the ICBC parkade (entrance off Roger’s Ave). Paid parking is available in the Pinnacle Hotel parkade and there is time-limited free street parking around the neighbourhood. What’s happening? There will be 140 modern quilts on display. We invite you to support our members by voting for your favourite quilts. We have 3 beautiful, handmade Viewer’s Choice ribbons to award on Sunday afternoon at 3:00 p.m. (voting closes at 2:00 pm) as well as one ribbon for the favourite Modern Mini Challenge quilt. Other ways you can participate include purchasing a $2 raffle ticket on our beautiful charity quilt in support of Growing Chefs or buy a cute VMQG logo button at our entrance or exit table. Don’t forget to leave some time to visit our community craft table and create your own modern mini quilt as fabric collage on paper! 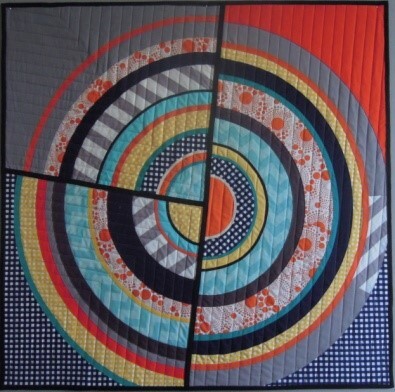 Do you love the look of circles in quilts? But are you intimidated by sewing curves? 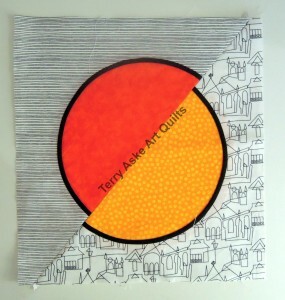 Terry Aske is a longtime VMQG member who makes amazing art quilts and blogs at TerryAskeArtQuilts.com. Her work has won awards, is regularly published in magazines, and was included in a recent book. And she’s intimidated by curves too! She uses a variety of techniques to create her circle quilts that are simple, easy and effective, and she’s going to share them with us! We will make 12 inch square blocks using a variety of techniques. The blocks could become a small wall-hanging, a pillow cover, or the start of a larger quilt. 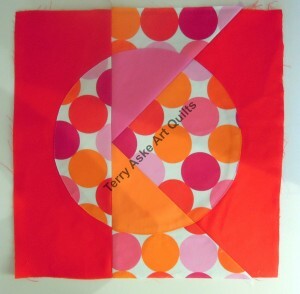 Terry blogged about some other examples here, you should check them out! So come join us for a day of circles!! The workshop is now full. Please email workshops@vancouvermodernquiltguild.ca to get on the waiting list.